Trained at the Chelsea School of Art and Royal College of Art, his first one- man show was held at the Robert Fraser Gallery, London, in 1965. While he generally uses traditional subject matter, like landscapes and still-life, his style and approach to art, is reminiscent of Pop art. Patrick Caulfield’s use of bright blocks of flat colour and thick black outlines became a hallmark of his style and has gone on to influence other artists such as Michael Craig-Martin and Julian Opie. Caulfield was a slow worker with his paintings taking months to finish. In works such as After Lunch he inserted highly detailed photorealist sections into his characteristically stylized images, playing with the viewers definitions of reality and artifice. 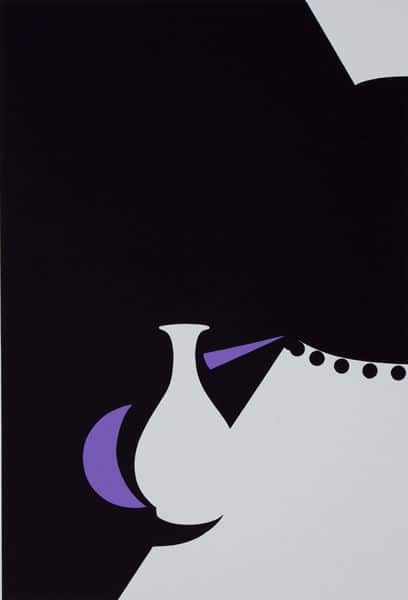 Patrick Caulfield’s seemingly anonymous painting style is instantly recognisable. Although he disliked being identified with a particular art movement, he is often associated with British Pop Art because his subjects are often commercially produced or kitsch. However, unlike Pop Art he wasn’t interested in social realism or social comment and nor was his subject matter obviously contemporary or overtly American. Instead, he chose subjects that were ambiguous both in tone and context, such as images taken from manuals or cliched holiday destinations directly lifted from postcards. His paintings look like commercial advertising or a painting-by-numbers illustration because he removes all visible brush marks, limits his palette to bright bold colours in commercial gloss paint and surrounds his patches of flat colour with strong black outlines. Caulfield’s painting style was in part a reaction to the highly personalised painting style of Abstract Expressionism, but he was also strongly influenced by Fernand Leger and the Cubist painter Juan Gris. Patrick Caulfield is celebrated as one of Britain’s greatest Pop artists. A student at the Royal College of Art he is associated with contemporaries such as Derek Boshier, David Hockney, Allen Jones and R.B.Kitaj. Using flat unmodulated colour contained by clear outlines, Caulfield’s work depicts the objects and places, often interiors, that were close to him.